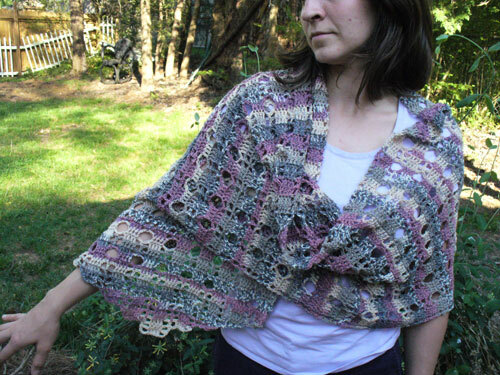 The stole is named for a lovely little castle on the Isle of Wight located in the English Channel off the south coast of England’s mainland, which I enjoyed visiting on a summer afternoon. Carisbrooke Castle has a famous, very long, set of stairs to the “keep,” and you will find the stairs at each end of this stole, creating a lovely sculptural effect. 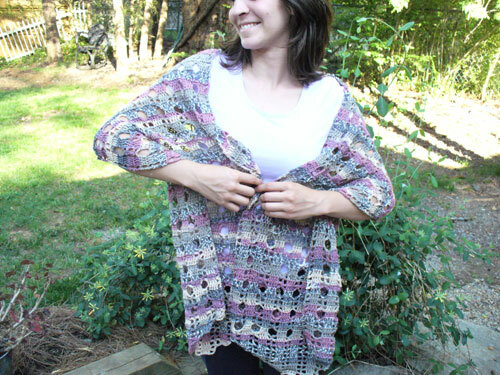 A light and lacy summer wrap, just right to keep shoulders warm in air conditioned buildings, or on outdoor summer evenings. Gently tapered ends add interest to the overall shape, and are reminiscent of the Carisbrooke Stairs. US H8 (5.00 mm) or size needed to obtain gauge. 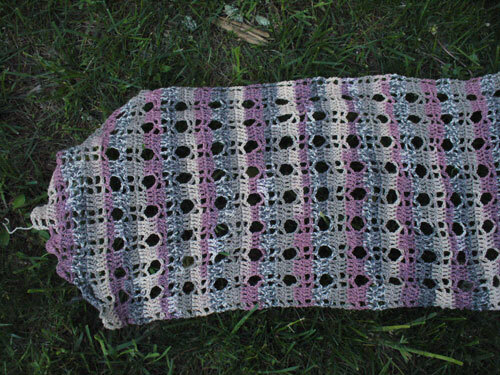 Gauge: 8 rows in pattern = 4”/10cm although exact gauge is not essential for this pattern although smaller stitches will result in a stiffer, denser fabric and smaller finished measurements. 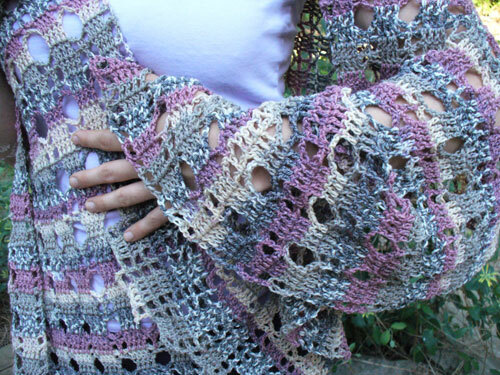 Increases in increase section are made similar to increases in filet crochet – by using chains, slip stitches, and foundation double crochet to extend the row beyond the width of the original chain. The “Increase group” of stitches is detailed in the Special Stitches section and is used for the first time for row 3. The instructions also include a symbol chart for more detailed instructions for the Increase Group (ig). The total number of 4-dc groups in a row is indicated by [ ] at the end of the row. Increase Section – Starting with a single 4-dc group, Rows 1-10 create “stair-step” increases at beginning and end of each row, until there are 9 4-dc groups in each row. Yo and insert hook in place indicated (in this pattern, either the 3rd ch from the hook or the base of the last dc made). Yo and draw up a loop (3 loops on hook), yo and pull through 1 loop (chain stitch made, 3 loops still on hook), yo and pull through 2 loops, yo and pull through last 2 loops (dc stitch made). Several video tutorials are available online for fdc, if you are not familiar with this stitch. Ch 7, sl st in same ch where dc was just made, turn and sl st in first ch from hook (7th ch of 7 made). Sl st in ea of next 2 ch, ch 3, sk next 2 ch, sl st in next (chains just completed count as 2 dc), ch 1, turn. Work an fdc, inserting hook in base of ch-3 just made (counts as 3rd dc), yo and insert hook in base of first fdc, complete another fdc (counts as 4th dc – 1 4-dc group added at end of row, consisting of ch-3, ch-3, fdc, fdc). Ch 7, sl st in base of last fdc made, turn and sl st in next 6 ch (counts as a ch-2 space and a dc in center ch of ch-5 turning chain). Row 10 Repeat row 6. [8 4-dc groups and Increase Section is complete] Do not fasten off. 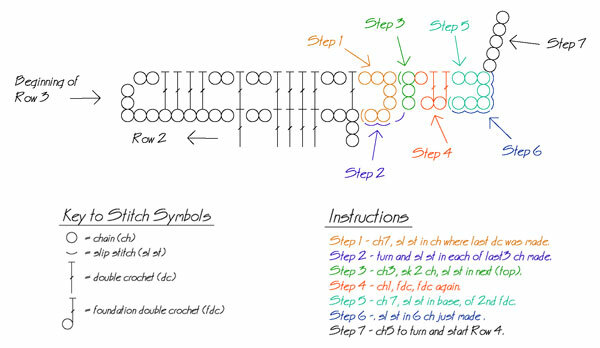 Pattern stitch is created by repeating rows 11- 14, across rows of 9 4-dc groups. Row 11 Ch 13, turn, *dc in ea of next 4 dc, ch 2, sc in next dc, ch 2,* repeat from * to * across, ending with dc in 3rd ch of turning ch-5. Row 12 Ch 5, turn, *dc in ea of next 4 dc, ch 5,* repeat from * to * across, ending with ch 2, dc in 3rd ch of turning ch-5. Row 13 Ch 5, turn, *dc in ea of next 4 dc, ch 2, sc in 3rd ch of next ch-5 arch, ch 2,* repeat from * to * across, ending with ch 2, dc in 3rd ch of turning ch-5. Row 14 Ch 5, turn, *dc in ea of next 4 dc, ch 2, dc in next sc, ch 2,* repeat from * to * across, ending with dc in ea of next 4 dc, ch 2, dc in 3rd ch of turning ch-5, ch 5, turn. Ch 5, turn, *dc in ea of next 4 dc, ch 2, sc in next dc, ch 2,* repeat from * to * across, ending with dc in 3rd ch of turning ch-5. Repeat rows 11 through 14, ending with a row 14. Repeat rows 12 through 15, ending with row 14 on row 146. Note: If a longer length is needed, continuing repeating rows 15 and 11-14 until the desired length is reached. Mirroring rows 1-10, the other end of the stole decreases each row in stair-steps to create a matching end. At end of row 9, fasten off and weave in all ends. This project will benefit from blocking the ends, by misting thoroughly with water and pinning the corners of the increasing and decreasing “stair-steps,” stretched out, until dry.